I visited the merchandise tent at Edgefest 2008 and one tee shirt in particular caught my eye. 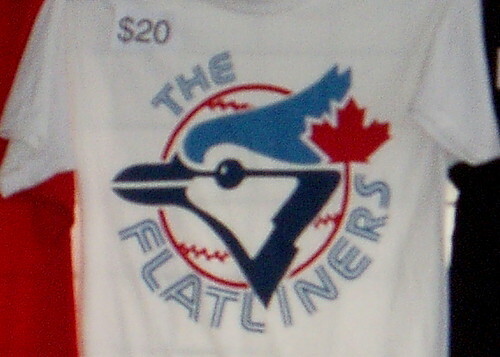 The Flatliners, a punk rock band from Richmond Hill and Brampton that I featured here, sell a shirt modelled after the original Blue Jays logo so near and dear to our heart. It's awesome. It's the retro Jays logo with the words "The Flatliners" replacing the team name. I don't know if Rogers would have an issue with this, but I certainly hope not. I love it! I want this shirt!! Do you have any to sell?